London burns anew with the fires of accusation. Titus Oates has accused scores. Many a Catholic, who, excepting their vile, idolatrous sect, are otherwise good men, fear for their very lives. Jack has rallied to Oates' cause, and he has asked me to record any "papist utterances" Sean might make. I am less sure. On the one side, a friend at the Society recalls booting Oates from St. Johns College, and a colleague from my navy contract shocked me with rumors of Oates' conduct as a ship's chaplain. 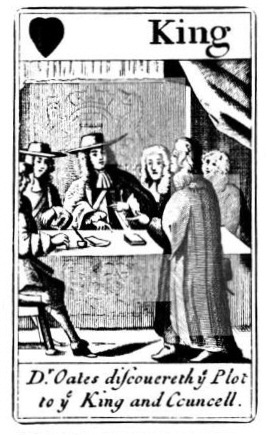 On t'other, I give a fair mark to anyone who accuses that belcher Samuel Pepys of anything. Regardless, I find it remarkable how quickly the public imagination digests such events. I post here the "King of Hearts" from a deck I bought on the street yesterday, mere weeks from the start of this mess. I hope we may keep our heads about us. Many a time have I said that the only thing I dislike more than a bigot is a Catholic, and it has oft given me grave moral concerns that I consort daily with a man who embodies the less flattering of these troubling qualities. 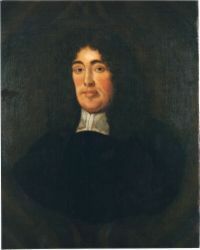 Anyone who has been following events in Parliament lately will know that, thanks to the noble, patriotic work of a gentleman named Titus Oates, a vast Papist conspiracy has been uncovered that threatens the very fabric of English society. And readers of Peep This Diary will doubtless be asking themselves the very same question that I have been pondering this day: Is Sean a terrorist? Perhaps more importantly, could my close association with this man reflect badly upon me if public sentiment against Catholics grows as more information about this Popish plot surfaces? I have ever considered my duty to King and country a sacred one, while loyalty to my friends (as truly important as it is to me) is in comparison, but a convenience. And so it is with no regrets at all that I have decided to begin keeping a very close watch on Sean's daily activities—that I might discover evidence of his malfeasance (if such exists) to protect me in the event that I am questioned about our connexion. Patrick's brother Edward has generously committed to engage some gentlemen who will follow Sean during the day this week, and I will report back should any damning information come to light. For now, though, Sean and I have plans to spend the evening drinking together. It is the duty of the law to judge him innocent or guilty—for my part, I can only be so magnanimous as to judge him on his merits as a friend. And I am immensely proud to call him one. For the time being. Like Patrick referring to the Crimson Unicorn as “the Uni,” this upsets me to no end. I think Jack us purposely riling Edward, a man who on more than one occasion has attempted to put us in the grave. At the moment, Jack employs this tactic frequently on the golf course, but I can suggest more productive outlets which are in tune with both their natures…. Update: I have meant to post this for quite some time. My apologies, but our household has been unsettled, to say the least…. I enjoy High Passions. As my days are spent mostly drinking and avoiding my wife, any change to my routine is both welcomed and applauded. Jack and Patrick detest them, believing that an emotive demonstration reveals a weakness of character unfit for men of stature. Things are a bit dicey when the subject matter is Love. Saucy wenches who refuse his advances are met with tears and a “curse upon their house and their pig whore of a mother.” He has twice threatened to defenestrate himself in vexation with claims that “his heart can take no more.” While I do not doubt his sincerity, it scares the clientele at the Crimson Unicorn and can be extremely damaging to one’s effort to write a post when one's roommates is constantly threatening self immolation. Thankfully, I have some peace this afternoon as the good Captain has decided that his latest adventure deserves to be inscribed in ink, and has gone off to have his sailor friends tattoo an anchor or some such object upon his arm. I do hope it is done in good taste. There are few things worse then waking up on a beautiful autumnal day and realize that the company you keep consists of one slightly soused maniac, and one pedant whose head is lodges so firmly up his own arse that he would need a candle and sextant to find his way out. Let me expound upon one case in point. I have recently returned to Jack’s house after escaping the less than affectionate ministrations of my wife. I secured my position not through an act of Christian charity on Jack’s part, but through the more direct route of blackmail. In my possession I currently hold several letters of “dubious” character, in which Jack expresses thoughts best left unwritten. One missive begins “My rosy buttocked Clara,” and then continues in a manner so laughably odious that I am inclined to think that Jack was beyond his normal state of inebriation and had instead journeyed into lands uncharted in his drunken pursuit of romantic prose. Another first prize choice is where he compares young Clara’s undergarments to the fog upon the Thames, both thick and unassailable. I feel naught but shame for young Clara, for the first comparison I would make about my own person would not reference a foul, bilious body of water. To come back to my original point, one would think that with such ammunition in my possession that Jack’s manner would be more conciliatory. Further, one would think he would forgive my episodes of high spirits where I make lewd gestures at his maids and threaten to beat George about the head with a cudgel. Such is not the case, as he has repeatedly made good on his threats to “set the dogs loose’ upon me. I fear that the London Gazette will have a new headline this week, one in the phrase “forsooth, my love doth froth in my loins like a fizzy cider,” will become publick currency. It took me full three hours after waking this morning to notice that the house was uncharacteristically peaceful, and that the reason for this new-found tranquility was the unexpected absence of both Patrick and Sean from the premises. And it was only just now that I remembered why it was that they were gone. My recollection is somewhat hazy on the subject, but the substance of the matter is that I may have accidentally set the dogs upon them last night in the course of a heated discussion that we were having about house guests who have outstayed their welcome. It has been almost a full day now since the event, and I am quite concerned that they may have interpreted it to mean that they are no longer welcome here, which is not true, as I find myself completely at a loose end without them. So, Patrick, Sean: If you are perchance reading this, please be advised that although I consider it pretty shabby of you both to have left so abruptly, I shall not stand upon ceremony and ask for an apology. You may return at any time that suits you, and we shall let bygones be bygones. Update: My manservant, George, informs me that the conversation about house guests which I refer to above only took place in my head. Apparently, I walked out of my chambers and set the dogs upon them without provocation while they were dining. I will admit that this was perhaps a little extreme and I apologize for it, though I am certain they must have done something to deserve it. Nonetheless, this may be a good time to impose some restrictions on my afternoon drinking habits. Late Update: As Addy points out, this incident was clearly not my fault at all. George has been summarily let go, and as soon as he recovers from the dog bite, I may well press charges against him for his shameful negligence in this matter.